Over the last 2.5 weeks there have at been at least five collisions that have resulted in the vehicle overturning, which is a higher than average amount for such a span of time, something people have pointed out in comments and on social media. Fortunately, most of those involved were either not injured or received minor injuries. In one case an oil patch on the road was cited as the cause, and in other cases the driver ‘losing control’ of the vehicle was cited. 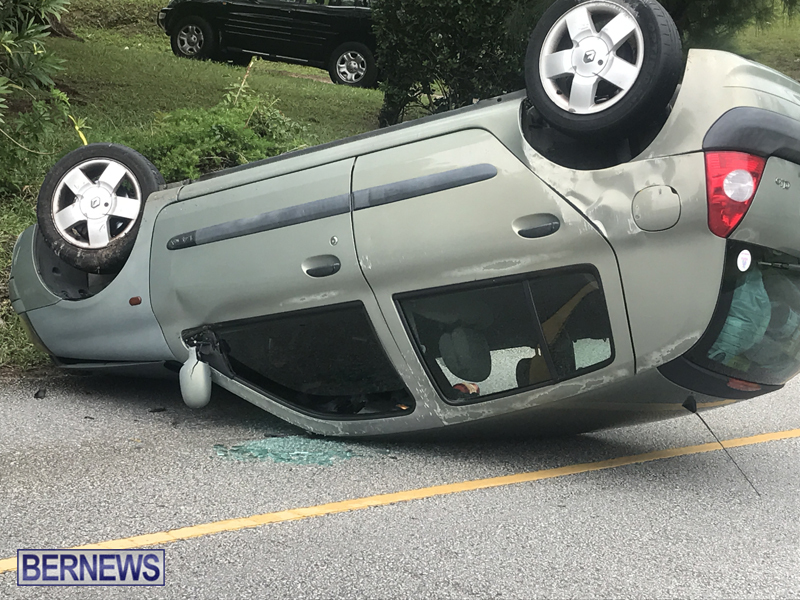 Two women were “transported to hospital for treatment of minor injuries” after a car “carrying three women had overturned after the 72 year-old driver collided with a wall” the police confirmed on August 5th. 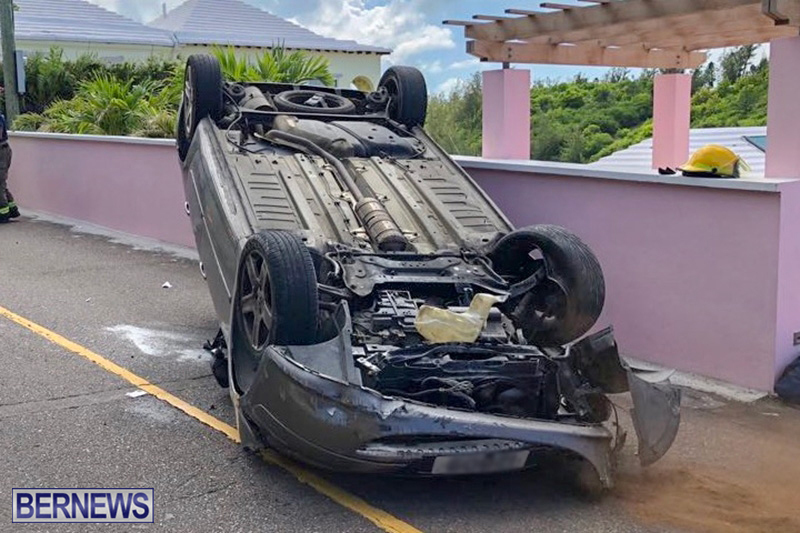 A police spokesperson said, “Around 3:55pm on Sunday 5th August, police and other first responders attended a report of a single vehicle collision which took place along Somerset Road Sandys, in the area of Scaur Hill. “Initial information suggests that a private motorcar carrying three women had overturned after the 72 year-old driver collided with a wall. Police Media Manager Dwayne Caines said, “At 11.57am police and other first responders attended a report of a road traffic collision that took place on North Shore Road in Hamilton Parish, just adjacent to Fractious Street. 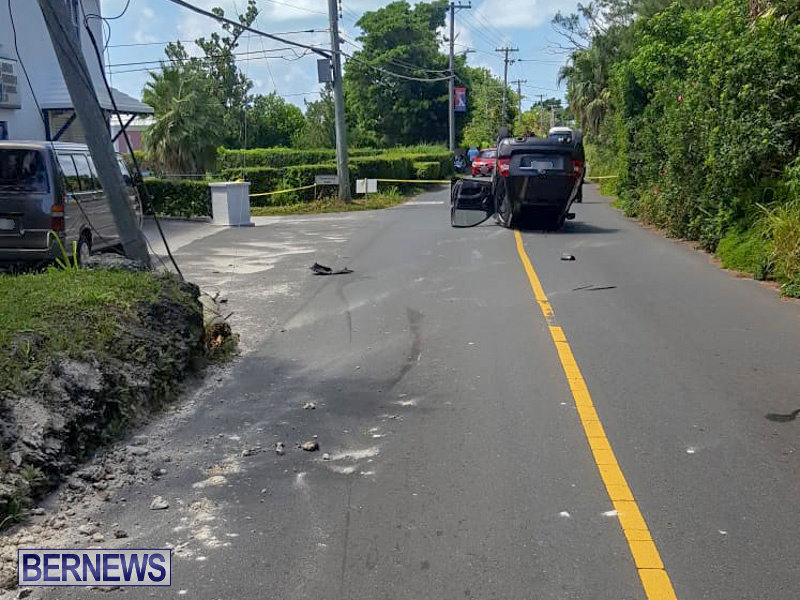 A police spokesperson said, “Around 9:57am Police and first responders attended a single vehicle collision along St. Marks Road Smith’s, near to the junction with South Road. Police Media Manager Dwayne Caines said, “A collision has occurred on Middle Road in Sandys in the area of White Hill Field. It appears that a car collided with a utility pole and overturned. Police Media Manager Dwayne Caines said: “Police responded to a report of a road traffic collision that took place at 7:08pm today [Wednesday] on Lighthouse Road in Southampton. 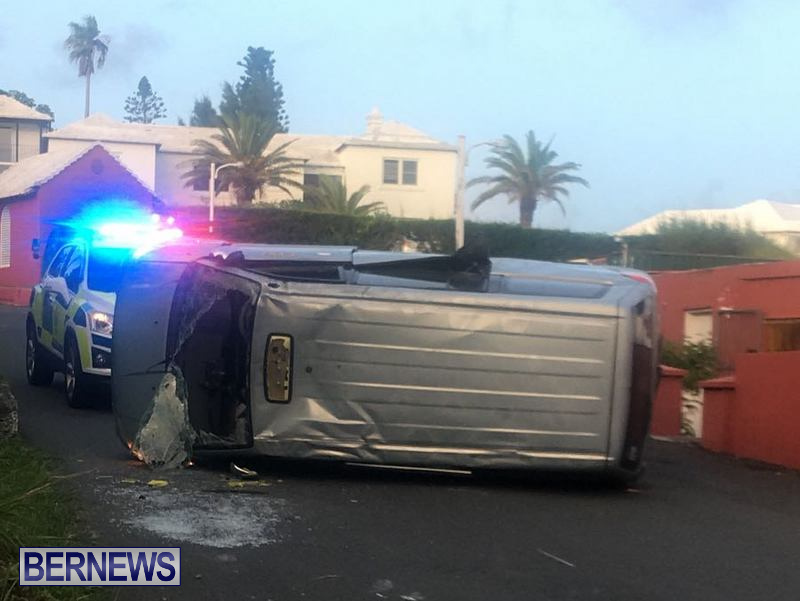 “It appears that a taxi was traveling north on Lighthouse Road in the area of Henry VIII Restaurant when it appears that the driver lost control of his taxi resulting in the taxi flipping over. 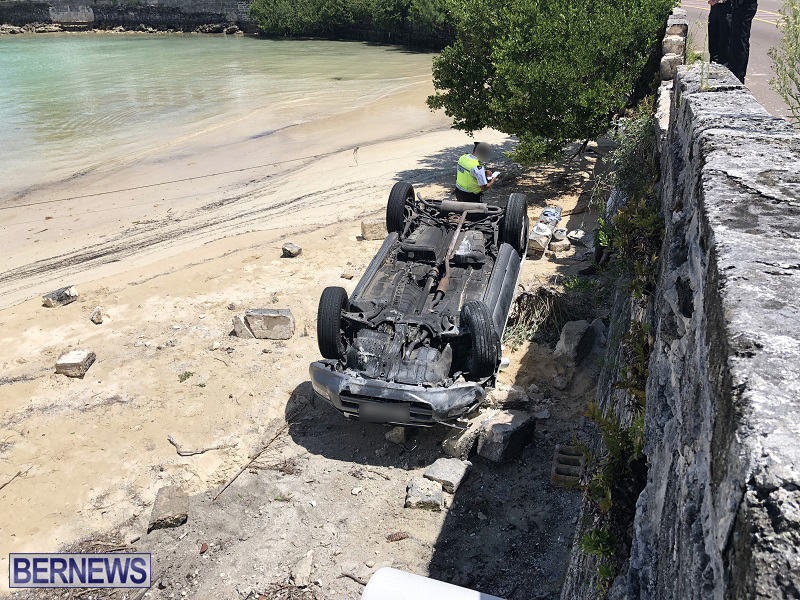 “The driver exited the taxi on his own accord however the female passenger [a tourist] had to be extricated out of the taxi by the Bermuda Fire and Rescue Service. 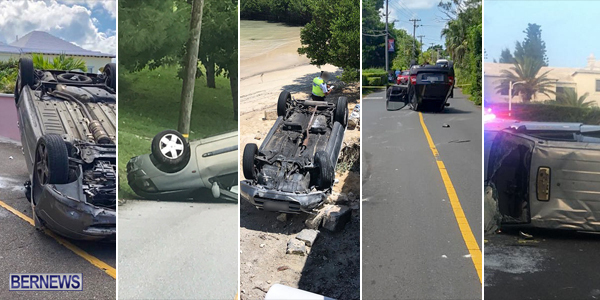 Not only are Bermudians skilled car flippers, many of them would win awards for the “not my fault” excuses. So how is the Road Safety plan coming along? “Operation Caution”? Oh I forgot. It’s a “plan”, not something that actually gets done. Funny, I was thinking about this just before I read this article. It is staggering that with the speed limit that any cars should overturn let alone this number. The mind only boggles at the cause …. Ive said for a long time that these walls are very dangerous. They should be taken down and accidents like this would stop. It’s the walls fault? How about don’t hit the wall and slow down? Cure = Stop posting until internet savvy . People are unwilling to let go of their land for road widening effort. Some houses are so close to the road that any relinquishing of land would mean that they cannot make modifications to the house because there’s law that states a house must be 10 feet away from the property boundary. But if you widen the road, people will merely drive faster and the problem will still exist. In the end, people really just need to slow down. last sunday I went on my bike from St.George to Hamilton. I made 40 km/h ( I know it is already more than allowed .. ) in words twenty three cars passed by because I was ( in their opinion ) to slow. countless bike as well but I was unable to count them. cant it be that the main issue is the speed ? obviously the majority is ignoring the speed limit . speed is ( imo ) the main reason for those flip flop cars . Couldn’t agree with you more – absolute madness on our roads and, while we know the traffic police can’t be everywhere, other solutions must be found as we simply can’t go on like this! Bottom line: do all these ‘accidents’ affect our insurance costs? Insurance across the board? Possibly although I think if you have no recent ‘accidents’ your costs shouldn’t rise (much). That said I’m surprised the conspiracy theory of law enforcement/govt/insurance companies in cahoots via inaction hadn’t gotten any steam over the years. Nowadays I rarely ever have to be in a hurry and when I do need to make time I always leave well in advance . I like playing civility games now and then and my favorite is to stop for the red light just when it’s changed at locations where road works are being done and there’s no police monitoring them. Recently there was works being done on Middle Road in Warwick and as the light changed to red I stopped . I then counted 12 cars and 3 trucks that kept on going through after I was stationary. The woman driver in the last car even gave me the finger. Ahh , 2 Bermudas , gotta love it. This asn’t fair ! I demand a thread where we get to demonize all bike riders . People are quick to blame bike riders, but cars are equally as bad. If we take the 3rd laners on East Broadway in the morning out of the picture one would quickly see that the two wheeled problems fall into a very small and select group , all sharing something in common. As I always say , if every car driver were to change their steering wheel for a pair of handlebars for a month or more they’d quickly learn how dangerous , threatening and bad the car drivers are. Oh , and trucks as well . Let’s be clear here – none of these muppets should be allowed to drive again. What happens when someone does this because of speed/texting/not paying attention and crushes a child at the side of the road? Its a long hot summer” let you heart not be troubled”. Planting flowers on the Crow lane round about can wait. The poor conditions of most of the roads and the overgrown road side vegitation are all some thing we all can do some thing about. Poor road drainage cause hydrolics whichcauses pot holes , W & E knows that. The general public also has a measure of responsibility to cut back their road side overhanging vegitation. It’s actually a law now that you must trim back your hedges or W&E will cut them for you at the steep price of $1,000. Losing control is not a thing in 99% of the cases. We use this phrase like it’s a reason – well it’s not. They were mostly either going too fast, not paying attention, driving dangerously or some combination. Let’s call it what it is. My mother is always saying “what if you lose control”. Funnily enough, I’ve never lost control because I’m a careful driver. Indeed, “losing control” is a bit of an easy way out and shifts at least part of the blame away from the driver of said vehicle. Well there goes the “It’s the bikers” argument.